Well, yesterday was a truly great day even though the snow is still lying on the ground. Why? Well, for one, I finished Clue 7 of my SOTSii! First, I got to meet Wannietta for the first time at a knit cafe called “In The Loop” in my neighbourhood. Also met another local knitter, Kelly. I had a lovely time. I also scored some royal purple Silken!! It’s Wannietta’s fault. Really, it is. She threatened me with dire knitting curses such as “You will frog three rows for every two and a half that you knit” if I did not buy it. 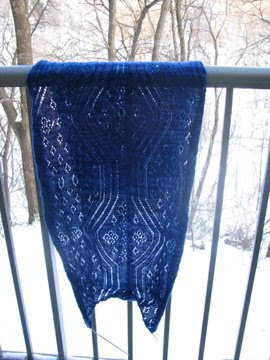 So, now I’ll just have to make another River Rock scarf, I guess. I then ventured out again to run some errands. While standing in line at #@$&(#*&$@(@#*$& Forest Hill Loblaws, I decided that I was way overdue for a visit to Zia Mosaics. I’ve never quite seen a shade of rose like this! And finally, my all time favourite colour of stained glass: oilslick!!! Susanna at Zia calls it “gas glass”. I truly love it. If Handmaiden came out with this colour in its seasilk line I would likely have to declare bankruptcy within about a week. 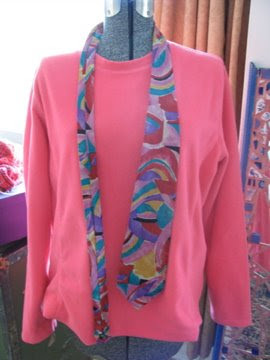 And finally, I headed to the Goodwill and scored this hot pink fleece top and necktie! – I came to the end of my beadwork pattern at Row 419. This will make the rest go much faster. – I only started my third skein of Malabrigo at Row 417!!! Which means I have plenty left for the shawl! I feel as though I’m in the home stretch… I think there are only two more clues to go. So, that was my Saturday. Today, the Icarus!